"Instead of selecting persons of eminence, with whom (as though with jewels) the church of York had formerly glittered, he conferred benefices on striplings, or even boys still under discipline of their masters, better calculated from their age to build up childish houses, to yoke mice in little wagons, to play together indiscriminately, and to ride on it long reed, than to sustain the character of dignitaries in the church." I'm afraid I can't elucidiate what 'to ride on it long reed' means, and google doesn't help. Any ideas? As I am mine, their sweating selves but worse. This is sort of technically a Christmas carol, but in The Oxford Book of Carols it's designated a carol for 'January and February', and frankly these months are so in need of a bit of brightness that it's right they should have their own carol. The third verse is the key, but the whole thing fits very appropriately in this inbetween season of the year: speaking of Christ's birth but with a focus on the conquest of death, it looks back to Christmas and forward to Easter at the same time. It makes a difference to read (or sing) a line like "Gladness and salvation... came on Christmas Day" when Christmas Day was a month ago, rather than on the day itself. I often feel it's a shame that Christmas is the subject of so much superb art and poetry and music and yet we only get to enjoy it for a few days (twelve at the most!). There's enough beauty and theology in one collection of carols to occupy the mind and heart for a whole year - for many years - and we rush through them so fast. For this reason, though it isn't yet Candlemas - the traditional end of the Christmas season - I'm happy to have a carol like this one to keep me going. In case you can't tell, it's dark and cold right now. But the days get longer, and light wins in the end. 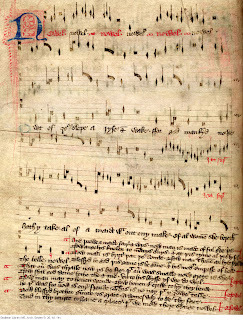 The words to this carol are by J. M. Neale, and you can see the sheet music for the tune here- it's from the sixteenth-century manuscript compilation Piae Cantiones. I couldn't find a recording on youtube, but there's a kind of improvisation on it here which is very nice. So, who knows anything interesting about the Norwegian bishop St Eysteinn, whose feast day is today? I do! My interesting fact is that Eysteinn was one of Thomas Becket's earliest fans - everyone was a fan of Thomas Becket in the 1180s, but Eysteinn took it pretty far. He was Archbishop of Nidaros from 1161, and he corresponded with Becket while the latter was Archbishop of Canterbury. Thomas Becket wrote a lot of letters - he corresponded with everybody! - but there were strong links between the English and Norwegian churches in this period, and Becket's murder in 1170 made almost as big an impression in Scandinavia as it did in England. * Eysteinn was Archbishop at a period of civil war in Norway, and his support for King Magnus against the rival Sverre brought him into trouble. After a number of battles, Magnus was driven out of the country in 1180, and Eysteinn had to flee to England (pronouncing excommunication on Sverri as he did so). He stayed in England for three years. We don't know exactly where he was all that time, but he spent nine months staying in the monastery of Bury St. Edmunds, from 9 August 1181 onwards - his stay is mentioned by the chronicler of that house, Jocelin of Brakelond, who was a monk there during Eysteinn's visit. (Jocelin calls him 'Augustine', a Latinising of his Norse name, and notes that he received ten shillings a day - which seems like an awful lot! - from the abbey's funds, at the command of the king). 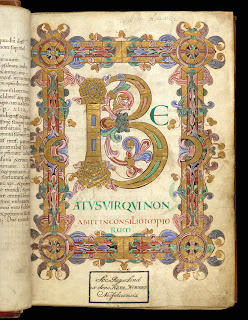 Eysteinn was the author of a Vita of St Olaf, and perhaps brought it to England with him; a copy was preserved at Fountains Abbey. 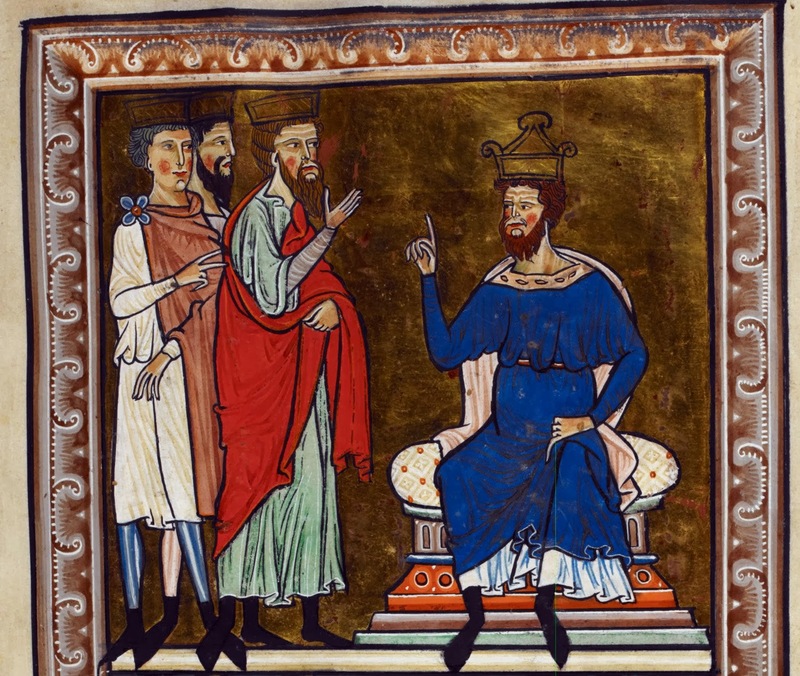 He probably went to Canterbury too, to visit the shrine of Thomas Becket, and most likely he also visited Henry II - Henry (who was perhaps in the mood to be nice to persecuted archbishops) gave him support out of the royal coffers. The parallel between Becket, who had spent time in exile from England because of his disputes with Henry, and Archbishop Eysteinn was fairly obvious. The English chronicler William of Newburgh finds space in his history for Eysteinn's story; he explains it by saying that Sverre, "having abjured the sacred order, and taken in marriage the daughter of the Gaut-king, wished to be solemnly crowned by the archbishop. But he, since he was a great man and not to be induced by prayers or threats to pour sacred ointment on an execrable head, was driven by Sverri from his fatherland." The English chroniclers had presumably got this information from Eysteinn himself (though one hopes he didn't describe himself as a 'great man'!). It was not Eysteinn's fate to be murdered at his own altar, though; he returned to Norway in 1183, was eventually reconciled with Sverre, and died peacefully enough on this day in 1188.
by John Ellerton (1826-1893), whose more famous evening hymn is 'The Day Thou Gavest, Lord, is Ended'. The third verse of this one should appeal to anyone who has ever sung in a church choir. Faint, indeed. 19 January is the feast of St Wulfstan of Worcester, vegetarian, anti-slavery campaigner, and eleventh-century bishop. Appointed Bishop of Worcester late in the reign of Edward the Confessor, Wulfstan was one of the few high-ranking English churchmen to keep his position after the Norman Conquest. When he died in 1095 he was the only English bishop left in England, and he was highly respected by Normans and English alike for his personal holiness and, in a way, as a relic of the Saxon church, which was so quickly taken over by Norman customs after the Conquest. For the English historian Eadmer, describing why St Anselm, as Archbishop of Canterbury, consulted Wulfstan about pre-Conquest English customs, Wulfstan was "the one sole survivor of the old Fathers of the English people". 1. First of all, the story of how he got his name gives a little insight into Anglo-Saxon naming practices. His father was called Æthelstan ('noble stone') and his mother was called Wulfgifu ('gift of the wolf'), so they named their son 'Wulfstan', combining elements from the two names. I suppose 'Æthelgifu' ('noble gift') would have been the other option, but that's a woman's name. Combining bits of other names to make new ones has become popular in recent years, and is often mocked as a ridiculous modern practice, but it was easy for the Anglo-Saxons, because many Germanic names are made of two free-standing elements which can be switched around. Most likely Wulfstan was really named after his very famous uncle, Wulfstan Archbishop of York, who was a prominent homilist, law-maker and advisor to both Kings Æthelred and Cnut - but the combining of names is a nice story. 2. As a child, being educated in the monastery of Peterborough, Wulfstan was taught by a monk named Earnwine, "an expert in writing and painting pictures... He had given the young Wulfstan some books to look after - a sacramentary and a psalter, in which he had illuminated the capital letters with gold. The boy was captivated by the rich decorations, and while his eager eyes explored its beauty, his mind was taking in the meaning of the words. But the teacher, looking to worldly advantage and hoping for larger profit, presented the sacramentary to Cnut, who was king at that time, and the psalter to Emma, the queen. The child was heartbroken at the loss." This touching story has a happy ending, though. 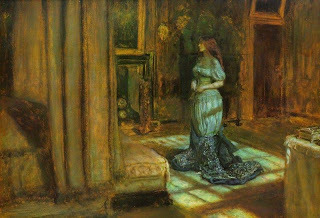 Wulfstan had a dream in which an angel promised the books would be returned to him, and much later they were: Cnut had sent the books to Cologne as a diplomatic gift to the Holy Roman Emperor, and in the reign of Edward the Confessor they happened to be brought back to England, and were given to Wulfstan as a gift by someone who did not know of his dream. Fetching lost books is a pretty useful saintly attribute! 3. Another story tells how as a teenager, back home with his parents, a local girl fell in love with Wulfstan. One day a large group of young people had gathered in a field, competing in races and atheletic games, and Wulfstan won all the honours of the game. "The rural crowd shouted his praises, re-echoing on the ears again and again." (Incidentally, this is a nice insight into how Anglo-Saxon teenagers amused themselves in their free time). Wulfstan, of course, remained humble despite all this praise, so the Devil put it into the mind of the girl "to dance in front of him to the accompaniment of a harp, with lewd gestures and shameless movements such as might gratify the eyes of a lover. And he, whom neither words nor touches had weakened [she had previously been in the habit of squeezing his hand to try and seduce him], now panted with desire, completely reduced by her disarming gestures. He immediately came to his senses, however, and bursting into tears, fled away into some rough undergrowth... There sleep crept over him, and a cloud came down from above, a bright and attractive gleam playing on the eyes of those who saw it spreading out to cover a considerable area, amazing the onlookers." They came and asked Wulfstan to explain what it meant, and he said it was a sign of heavenly love, and that from henceforth he would always be free from sexual temptation. His biographer notes that as an old man he often told these stories about his own life to encourage others - he told the story about his childhood to boys, and this story to young men. 4. Later, as a monk at Worcester, he was praying in the church at night when an old peasant came in and scolded him for being there so late, and challenged him to a fight. Wulfstan - knowing, of course, that it was the Devil in disguise - wrestled with the peasant until he vanished in a puff of smoke. "However, lest he should seem to have achieved nothing, the Devil trampled on the foot of the righteous man with the full weight of inquity, simply piercing it through as if with a red-hot branding iron. Godric, a monk in the same convent, who says he has often seen it... testifies that the wound penetrated to the bone. And I [that is, Colman] knew the boor whose appearance the Enemy assumed. He was certainly an appropriate fellow - with savage strength, monstrous wickedness and hideously deformed face." Out of humility, Wulfstan dressed in lamb-skin, avoiding ostentatious clothes. "On one occasion he was benignly reproved by Geoffrey, bishop of Coutances, showering the man with the most witty remarks, among which he asked why he wore lamb-skin, when he could and ought to have sable, beaver or wolf. He replied neatly that Geoffrey and such men practiced in worldly wisdom ought to make use of the pelts of crafty beasts, while he, who partook in no subterfuge, was content with lamb-skin. To which Geoffrey rejoined that Wulfstan might at least dress in catskin. "Believe me," replied Wulfstan, "We praise the Lamb of God more often than the Cat of God!" At these words Geoffrey burst out laughing, quite delighted". And one final story about dress and appearance. Wulfstan strongly disapproved of men with long hair. Apparently "if any of these yielded [Wulfstan] his head, he would cut away the unrestrained locks with his own hand. For this purpose he had a little knife, with which he used to scrape muck from his nails or dirt off of books... If anyone thought to refuse, he would openly accuse him of softness, openly warn him of misfortune. It would come to pass that those who were ashamed to be what they were born and imitated the flowing tresses of women, would prove no better than women in the defence of their homeland against foreigners. As much became evident with the coming of the Normans that same year. Who can deny it?" For more about Wulfstan, see this post, and for a visit to Worcester Cathedral, see this one. "All mankind is of one author, and is one volume; when one man dies, one chapter is not torn out of the book, but translated into a better language; and every chapter must be so translated. God employs several translators; some pieces are translated by age, some by sickness, some by war, some by justice; but God's hand is in every translation, and his hand shall bind up all our scattered leaves again for that library where every book shall lie open to one another." Something made me think of this - the last line, at least. It's from Donne's 'no man is an island' sermon. I think of it often when I'm in a library, especially the Bodleian, which owns a copy of every book published in the UK, and has done since 1610. According to trusty Google, they have more than 11 million books; they get 1000 new items every working day. Can you even begin to imagine how many books that is? I can't. And if I choose to, I can go and read any one of them, but I could never read - never even begin to hope to read - even a tiny fraction of what there is. I like books, and find them fascinating, and so it's a bit depressing to think about all the books I'll never read; but I find people even more fascinating, and so it's even more depressing to think about all the people I will never understand. This sermon just gives me a little hope that 'never' only means 'not in this world'. O quanta, O quanta sunt haec opera. Quam grata, quam grata sunt haec munera! Quam digna, quam digna est infantia! The which God grant us old and younge. Deo Patri, Deo Patri sit gloria. 1. Come, let us love God, the greatest in power, the Father, Son, and Holy Ghost, now reigning in the heavens, who made all mankind, great and small, and created man in his likeness; how great are these works! 2. The shepherds came to present their offering to that lovely child with utmost reverence. They gave their gifts to that child and were well received; how welcome are these gifts! 3. 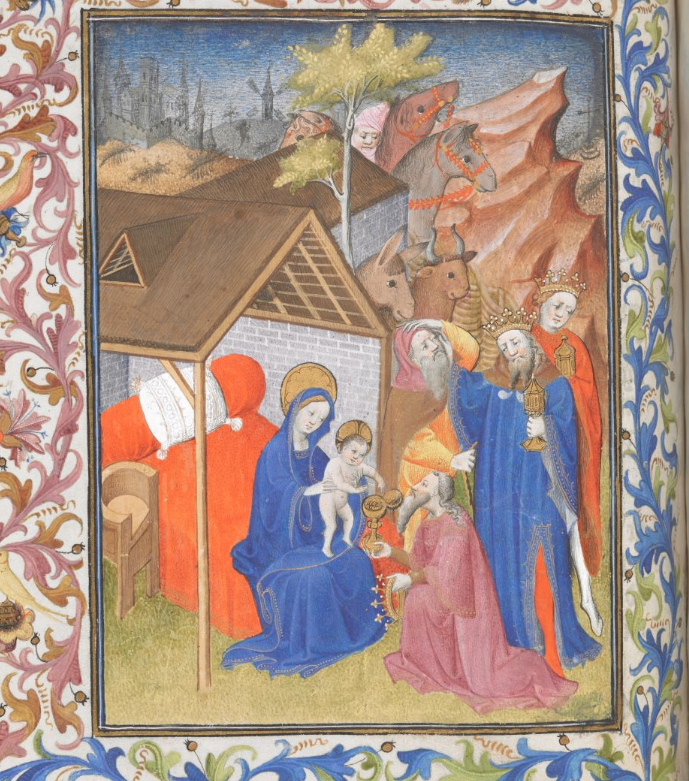 Three kings came from the east, finding the way by astronomy and by the prophecy of Balaam. They offered him gold, myrrh and frankincense, and he took them, as was his right; how worthy was that infancy! 4. They returned again full merrily and each came to his own country; O wonderful works of God! At their death they entered into the joy of heaven; may God grant that to us, both old and young. Glory be to God the Father! Another little moment missed out of the recent Voyage of the Dawn Treader movie. I've always loved this. "But look here," said Eustace, "this is all rot. The world's round - I mean, round like a ball, not like a table." "Our world is," said Edmund. "But is this?" "Do you mean to say," asked Caspian, "that you three come from a round world (round like a ball) and you've never told me! It's really too bad of you. Because we have fairy-tales in which there are round worlds and I always loved them. I never believed there were any real ones. But I've always wished there were and I've always longed to live in one. Oh, I'd give anything - I wonder why you can get into our world and we never get into yours? If only I had the chance! It must be exciting to live on a thing like a ball. Have you ever been to the parts where people walk about upside-down?" Edmund shook his head. "And it isn't like that," he added. "There's nothing particularly exciting about a round world when you're there." 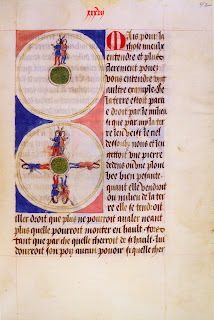 Medieval worlds: an English Mappa Mundi from c.1265, and some globe-trotters from a 14th-century French manuscript. Some photos taken after the aforementioned service of Vespers in honour of St Thomas Becket (a version of which I now learn you can buy on CD). These aren't particularly good photos, but it's not every day you get to see the crypt of Canterbury Cathedral by candlelight. Try and imagine those people are monks. The crypt is the oldest part of the present-day cathedral - it was built at the end of the eleventh century, in the time of St Anselm. Opposite that pillar, there's another one (for decorative rather than structural purposes, I hope!) which was part of a Roman building in Thanet. Herodes, þou wykked fo, wharof ys þy dredinge? And why art þou so sore agast of Cristes tocominge? Ne reueth he nouth erthlich god þat maketh ous heuene kynges. And sheuden wel þat he ys God in gold and stor and mirre. To halewen oure vollouth water, þat sunne hauet uordon. Bote þe water turnde into wyn þorou Crystes oune heste. Wyth þe uader and þe holy gost wythouten endeday. 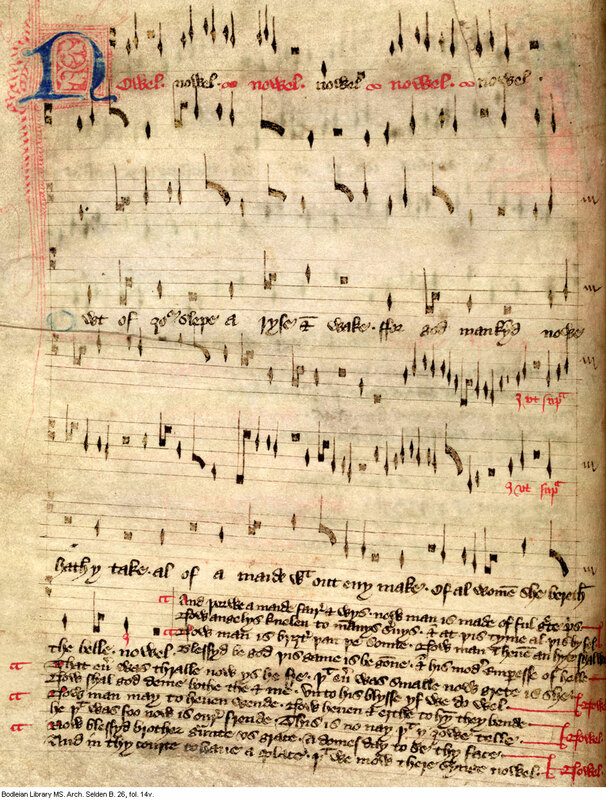 This is a translation of the fifth-century Latin Epiphany hymn 'Hostis Herodes impie' by William Herebert (c.1270-1333). 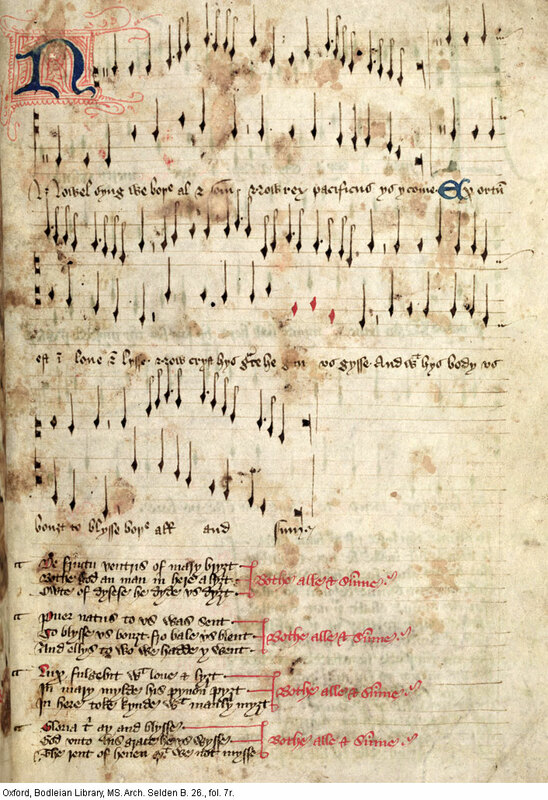 Herebert, a Franciscan friar, lectured in Theology at Oxford between 1317-19, and was a prolific translator of Latin hymns into English verse, often for use in sermons; you can see this hymn written in his own hand (!) here. Herod, thou wicked foe, whereof is thy dreading? And why art thou so sore aghast at Christ's coming? He takes not earthly goods away who makes us heavenly kings. And showed well that he is God in gold and stor and myrrh. To hallow baptismal water for us whom sin had fordone [ruined]. But the water turned into wine through Christ's own behest. With the Father and the Holy Ghost, without an ending-day. 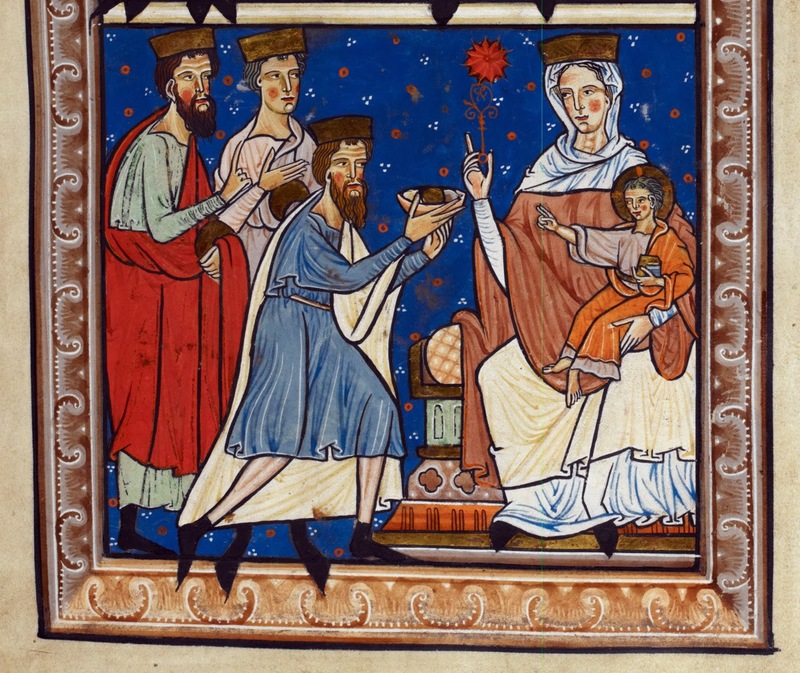 But Herebert adds to the second verse the names of the different gifts, gold and myrrh and 'stor', an Old English word for incense (the word frankincense did not appear in English until the fifteenth century). You can see that for Herebert, who was originally from the Hereford area, 'star' and 'far' (which he spells 'verre') both rhyme with 'myrrh'. That he will put thee from thy royalty? Why trouble thee against this lord to conspire? None so bright a path at any time saw they! To mortal man, priest and heavenly king. Odours of Edom and offerings divine? I think it's not possible to write a bad Epiphany hymn. The feast comes ready-made with superbly beautiful imagery - most of all, the star - and the metaphors for the Christian life write themselves. This is a lovely example, a translation of a Welsh carol by the Rev. W. Lloyd. 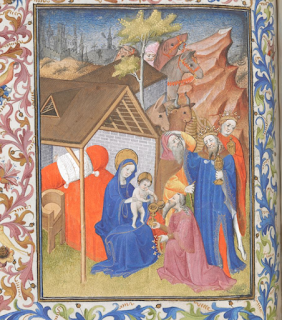 The Oxford Book of Carols has it with a tune by Canon Owen Jones, entitled 'Seren Bethlehem' ('The Star of Bethlehem'). "Both all and some" is an odd expression but it just means "all of us". Now Rex pacificus ys ycome. 1. Exortum est in love and lysse. Let us all sing 'Nowell', now that the King of Peace is come. 1. Love and joy have risen up for us, and now Christ has begun to clothe us with his favour. With his body he won heaven for us all. 2. He is the fruit of the womb of Mary bright: God and man together alighted on her, and brought us all out of misery. 3. A boy was born, sent to us; he won bliss for us, and brought us out of sorrow, otherwise we would all have been condemned to misery. 4. The light will shine out with love and brightness. He pitched his pennant [a knight's colours] in Mary mild, and in her body took on the strength of manhood. 5. Glory and blessing to God for ever. May God guide us with his grace, that we may not lose the right to live in heaven. A seventeenth-century carol by the English Seneca, Bishop Joseph Hall (1574-1656). 'Cratch' in verse 2 means 'manger, cradle'; cf. creche. See Heaven come down to Bethlehem's cratch. The King of gods in meanness dress'd. The God thy womb and arms have bore. Joy in your dear Redeemer's birth! All of a maide without any make. Of all women she berethe the belle. And at this time all this bifel. And his moder emperesse of helle. Unto his blisse, if we do well. He that was fo now is oure frende. This is no nay that I you telle. That we mow there singe nowel. 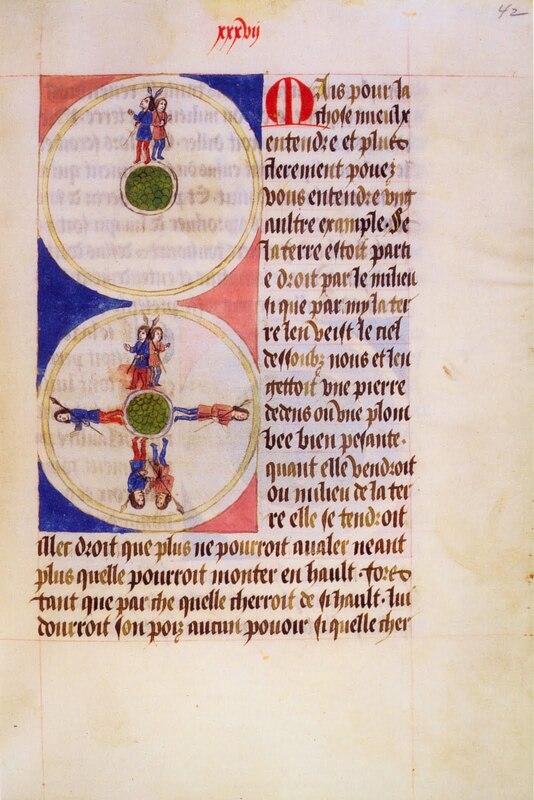 This is from the fifteen-century Selden MS, now in the Bodleian Library. Click on the picture above and you can read this very carol! 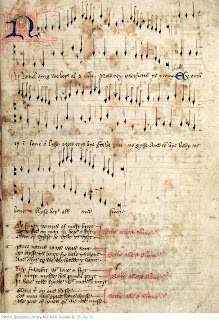 Note the lovely illuminated capital, and see how the red ink rubrics indicate when the refrain is to be sung. 'Beareth the bell' is one of my favourite Middle English expressions. It means 'win the prize', really, though the OED distinguishes between two phrases: "to bear the bell 'to take the first place, to have foremost rank or position, to be the best' and to bear or carry away the bell 'to carry off the prize'. The former phrase refers to the bell worn by the leading cow or sheep (cf. bell-wether) of a drove or flock; the latter, perhaps, to a golden or silver bell sometimes given as the prize in races and other contests; but the two have been confused." It's the first we have in this carol, but the second seems more appropriately chivalric with relation to the Virgin Mary. Think of winning first prize in a beauty contest, or carrying off the prize in a jousting tournament! The other feature I like is this carol is the emphatic repetition of 'now', twelve times in six verses, and echoed in the refrain 'Nowell'; it really underlines the point of verse 2, that it was at this time that all this happened. 1. Arise and wake out of your sleep, for God has now taken human form of a maiden without any equal [although 'without any make' also means 'without a mate' and thus also 'a virgin']; among all women she wins the prize. 2. And through this fair and wise maiden, mankind now becomes highly valued (/of great worth); now angels kneel at the service of man; and all this happened at this season. 3. Now man is brighter than the sun, now man shall dwell in heaven on high. Blessed be God and His mother, the Empress of Hell, because this joy has begun. 4. Whoever was a slave is now made free; whoever was small and unimportant is now made great. If we act well, God will now judge both you and me worthy of a place in heaven. 5. Now man is able to go to heaven; now heaven and earth bend before God (or before man? I'm not sure). Enemies become friends. There is no contradicting the truth of what I tell you. 6. Now, blessed Brother, grant us the grace to see thy face on Judgement Day, and to have a place in thy court, where we may sing to thee 'Noel'. From some seventeenth-century verses, to be sung to the tune of 'Greensleeves'. Who for our sins did often weep. And his blessèd side with a spear. Who for our good was born. Verse 2 refers to the fact that long before it was New Year's Day, January 1 was the Feast of the Circumcision of Jesus, also known as the Feast of the Holy Name, because it's the eighth day after Christmas. The Anglo-Saxon homilist Ælfric (c.955-c.1010) wrote a homily for January 1, in which he discusses Christian and pagan practices of keeping the New Year. Here are some extracts, in my translation (from this book). It is most rightly thought that the beginning of the year should be appointed to the day when the Almighty Creator fixed the sun, moon and stars and the beginning of all time; that is the day on which the Hebrew people begin the calculation of their year, as the leader Moses wrote in the book of the law. Certainly God spoke to Moses about the months; this month is the beginning of the months, and it is the first in the months of the year. Now the Hebrew people observe the first day of the year on the spring equinox, because on that day the time of the year was appointed. The eighteenth day of the month which we call March, which you call ‘Hlyda’, was the first day of this world. On that day God created light and morning and evening. Then three days went by without time being measured, because the stars were not created until the fourth day. On the fourth day the Almighty created all the stars and the seasons of the year, and said they were to mark days and years. Now the Hebrew people begin their year on the day when all times were created, that is on the fourth day after the creation of the world. The teacher Bede calculates with great accuracy that the day is the 12th calend of April [i.e. 21 March]. On that day we celebrate that holy man Benedict to honour his great virtues. Indeed, the earth also shows by the shoots which are then quickened again that it is the time when the year should most rightly begin, when it was created. Now foolish men practise divination by many kinds of sorcery on this day, in great error, according to heathen customs contrary to their Christian faith, so that they may lengthen their lives or their health; but in doing that they anger the Almighty Creator. Many people are also so greatly wrapped in error that they plan their journeys according to the moon and their deeds by the days, and will not let blood on a Monday because it is the beginning of the week - but Monday is not the beginning of the week, it is the second; Sunday is foremost in order of creation, in order, and in honour. Some foolish people also say that there are some kinds of cattle which man should not bless, and say that if they are blessed they go wrong, but are made obedient by cursing, and use God’s grace to injure them with the devil’s curses, without blessing. Every blessing comes from God, and curses from the devil. God made all creation, and the devil cannot create anything; he incites to evil and acts falsely, the origin of sin and deceiver of souls. Any part of creation which seems perverse has been brought low by sin. Holy men often lived in the desert among fierce wolves and lions, among all kinds of animal and serpent, and nothing was able to harm them; they tore horned snakes apart with their bare hands and easily killed great dragons without any harm through the power of God. Now you observe the days and months with vain sorcery. However, according to nature every bodily creation which earth brings forth is more full and vigorous at the full moon than at the waning; trees which are cut down at the full moon are harder and last longer as timber, most of all if they are sapless. This is no sorcery, but a natural thing, created. So, also, the sea agrees wonderfully with the course of the moon; they are always fellows in waxing and waning, and when the moon daily rises four prican (= fifth of an hour) later, so also the sea always flows four prican later. Let us set our hope and happiness in the foreknowledge of the Almighty Creator, who established all creation in three things: that is in measure, number and weight. To him be glory and praise for ever world without end. Amen.